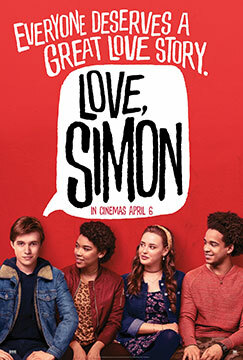 It’s already happened with Love, Simon, with some complaining that it’s ‘yet another’ coming out story (despite the fact that coming out is one of the few nearly universal gay experiences and that the films audience of teens – and not just gay teens – won’t have seen lots of coming out movies). Others have moaned that its mainstream sensibilities deny the oppression that many LGBT people face, even though Simon’s experience is probably closer to the reality for many young gay people in the West nowadays than a ‘right on’ tale of misery and oppression. All that ignores the fact that in its mainstream-ness it’s quietly revolutionary. For years people have said there need to be more films from major distributors where the lead character(s) happen to be gay, but otherwise it’s just like other comparable movies. This is that film. It’s a full-on teen flick with a story and plot twists that feel exactly like other Hollywood teen movies, but it’s about a gay kid. And the fact it’s a gay-themed studio release aimed at teens shouldn’t be ignored, as a few years ago that would have been almost unimaginable. Sure, Hollywood might have released a few serious, LGBT-themed film which were aimed at adults and were designed to win Oscars – or they included some gays to laugh at/with in a couple of rom-coms – but there’s been little like Love, Simon before. Oddly it’s how not unique it feels that makes Love, Simon unique. That may sound like I’m criticising the film, but I’m not. I love teen movies and Love, Simon is a really fun one. I saw the movie at the BFI Flare LGBTQ+ Film Festival with an audience that was about 90% gay men, and it got a great reception. Many gay people who’ve written about the film have commented that it’s the sort of film they wish had been around when they were a teen, but it works even for older gays. Director Greg Berlanti and writers Elizabeth Berger and Isaac Aptaker (based on Becky Albertalli’s novel) throw in a few neat observations and ideas that will only properly be understand by gay viewers, ensuring there’s enough familiarity and authenticity (amongst the rather Hollywood plot twists) to keep gay people of many ages happy. Things may have changed over the years, but there’s certainly plenty that happens to Simon that most gay people will recognise from their own coming out. As mentioned above though, some will undoubtedly grumble because it can’t represent the whole of the gay experience on its own. Until we have a multitude of mainstream films telling a variety of LGBT stories that grumbling will continue, but it would be nice if we could also judge each film on its own merits and appreciate Love, Simon as a sweet, fun film that will hopefully be the start of something. The movie follows the titular Simon (Nick Robinson), a high school student who knows he’s gay but hasn’t told anyone about it. While he knows most people in his life will probably accept him if he does come out, something’s stopping him telling anyone. He realises he’s not the only closeted gay kid at his school when someone leaves a ‘confession’ on a website for secrets. Despite now knowing who it is, Simon starts talking to his fellow closet case and finds he has a lot in common with him. Life gets more complicated when the slimy Martin (Logan Miller) discovers Simon’s secret and says he’ll tell everyone unless Simon helps him get together with new girl Abby (Alexandra Shipp). Feeling trapped Simon agrees, but that causes problems not just with Abby but also with his other best friends, Leah (Katherine Langford) and Nick (Jorge Lendeborg Jr.). 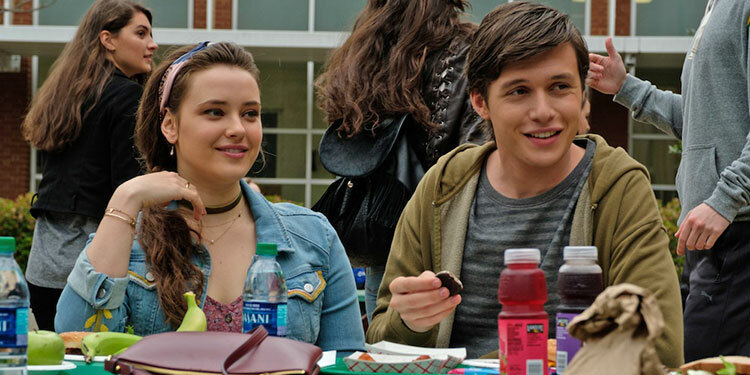 Love, Simon is a sweet and charming film with a few good laughs. It’s very feelgood, which ensures you know that while difficulties will be faced and lessons learned, nothing too horrific is going to happen and it’ll all work out in the end. There’s also a slightly sentimental edge – not least a need for pretty much everyone in Simon’s life to have their own coming to terms with him being gay moment, particularly his parents as played by Jennifer Garner and Josh Duhamel. Through the movie Simon tries to work out who the secret gay kid is, which is far smarter than most have given it credit for. Through the film a variety of Simon’s classmates are presented as possibilities at different points. It’s a very effective way of getting across the point that anyone could be gay, subtly suggesting how little about them would change if they turned out to be the gay one. That may seem obvious, but it’s a point not often made on film and it’s done well here. Some may roll their eyes at its occasional soppiness, but sometimes there’s nothing wrong with a movie that wants to say the world isn’t such a bad place after all. When much entertainment that includes LGBT people still either kills them off or treats them as a ceaseless sort of angst and tragedy, this is something different just by treating Simon so similarly to his straight peers in other teen movies. There are a couple of problems, perhaps the biggest of them being how close it takes Simon to being truly cruel. Although presented as confusion, foolishness and in a non-malicious way, he manipulates his friends to keep his secrets in an incredibly selfish way. Although he does face a comeuppance, he’d probably find it much more difficult to be forgiven in real life. The flaws and imperfections are wrapped up in a sweet, sugary confection that just wants to put a big fat smile on your face. It succeeds in that admirably, presenting us with a world which may have its problems but feels safe, sweet and simplified in a life-affirming way. Sure, it may not be exactly like real life, but there’s nothing wrong with a feelgood movie that works and for that movie to be from a major distributor and centred around a gay kid is something to be celebrated. Overall Verdict: A well-made, entertaining and funny teen movie, which happens to be about a gay kid. If you’re not a teen flick fan, Love, Simon won’t convert you, but even then its worth a look just because in its mainstream-ness it’s quietly revolutionary.